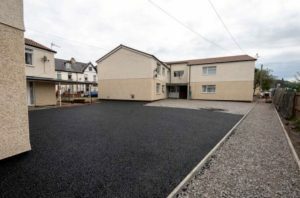 Thortech working in partnership with Ian Williams Ltd were awarded the contract to carry out groundworks, building works and resin bound surfacing at the site in Brecon. Work was started in June and fully completed in August 2018. 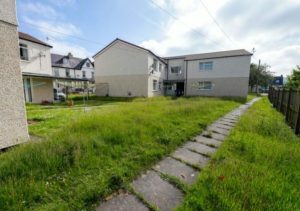 The end client, Powys Council have been investing vast amounts to ensure major improvements are made to the council housing areas. 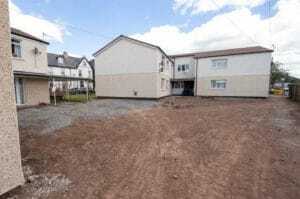 After quoting for the resin surfacing works on the project, Ian Williams awarded us the full contract for ground and building works at the site in Brecon. After being awarded the contract, Thortech attended a meet the clients day, effectively meeting all the housing occupants and ensuring they were happy with the work planned to be undertaken. This also gave the occupants a chance to put their thoughts forward and also have their say in some important decisions. 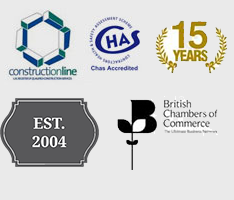 Our scope of works consisted of over 1000m2 of excavation works and tarmac, concrete pathways, ACO drainage channels, new manholes, build retaining walls, removing trees, kerb edging and 870m2 of Thorset resin bound surfacing. The first stage was to dig out the existing ground at the back of the housing estate to the correct levels and have all earth and waste removed from the site. 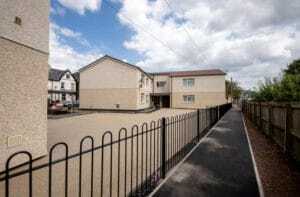 We then began installing pin kerbs to all edges ready for the tarmac pathway and resin bound surfacing areas. We then began building the retaining wall at two areas of the estate ensuring the majority of areas were kept as flat as possible. Work was then undertaken to start on the concrete pathways at the front of the estate, whilst this was ongoing our resin bound surfacing specialists installed 870m2 in our Danish blend at the back of the estate.